a. Why did Corbynism and Left social democracy appear in the UK? As part of our celebration the 1916 Easter Rising, we are posting two new articles. The first is by Allan Armstrong (RCN), and addresses Lenin’s response to in his Irish Rebellion of 1916 (which is also posted). The second comes from the latest issue of Socialist Democracy (Ireland) and looks at the situation in Ireland today, 100 years after the Rising. In the midst of the First World War, following the Dublin 1916 Easter Rising, Lenin returned to the issue of national self-determination. He had already addressed this at the beginning of the year in The Socialist Revolution and the Right of Nations to Self-Determination. Immediately before the Rising, he had also gone on to write The Discussion on Self-Determination Summed Up. Allan Armstrong (RCN) prepared a talk for the Conference of Socialist Economists Day School held in the Out of the Blue Centre in Edinburgh on June 21st. The article below incorporates some of the discussion points that were raised. 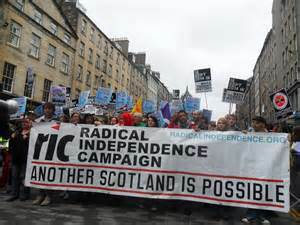 It provides a socialist republican analysis of the British Left and the case for an ‘internationalism from below’ alternative in the Scottish independence referendum campaign. This talk is also a chapter in the extended article, Making Plans For Nigel, which can be viewed at:- http://republicancommunist.org/blog/2014/06/26/making-plans-for-nigel/ A shortened version of this talk was also given as a contribution to the debate in the Left Unity Party – Glasgow South branch, on December 13th. On the British Left, continued support for maintaining the UK state and for upholding the internationalist nature of all-British party and trade union organisation stems from their understanding of the British ruling class and the United Kingdom. They view these as having played a key historical role in replacing the older feudal order in these islands, and other pre-capitalist societies in many parts of the world. The RCN has based much of its analysis of capitalism on the notions of exploitation and oppression, to which we counter the ideas of emancipation and liberation – hence the name of our main publication. However, we have been conducting discussions on capitalism’s third prop, alienation, and its antithesis, self-determination, understood in its widest sense. 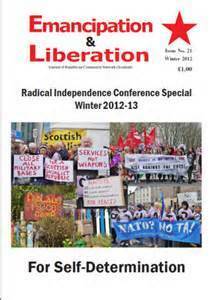 In the article below, by Allan Armstrong (RCN), which comes from Volume 1 of Internationalism From Below: Reclaiming a hidden communist tradition to challenge the nation state and capitalist empire, explores the relationships between exploitation, oppression and alienation, and between emancipation, liberation and self-determination. Communists, and sometimes others on the Left, use three key terms to help us understand social relationships between human beings in class societies. These are exploitation, oppression and alienation. Exploitation, oppression and alienation have become more developed in the later forms of class society, particularly capitalism. However, the ideologies used to disguise or justify class society have also become more sophisticated. Greece has become the flashpoint for Europe. The Greek economy has collapsed, but Spain, Portugal, Ireland, and even Italy are also spiralling downward. Nevertheless, only in Greece does there seem to be an organized political response that can directly challenge for power. 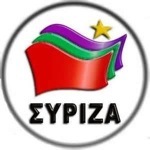 SYRIZA began as a loose coalition of parties and organization that sought to present a non-dogmatic left-wing alternative to the mainstream social democratic politics of PASOK. As the crisis has deepened, SYRIZA has snowballed in strength to the point that current opinion polls show it with more popular support than any other party. At the same time, SYRIZA has been evolving into a unitary organization with a recognized leader Alex Tsipras. From the start, SYRIZA has been dominated by those coming from the Eurocommunist tradition. It has always pursued a reformist path to socialism, but, as it has grown to become a significant player in Greek politics, it has modified its program to demonstrate that it could govern Greece in a “responsible” manner. 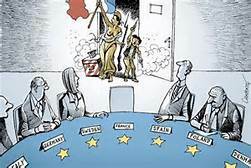 SYRIZA insists that further austerity cuts are not possible, and that the memorandum of understanding imposed on Greece by the troika (the International Monetary Fund, the European Central Bank and the European Commission) should be rejected. Still, SYRIZA is also adamant that Greece must remain within the European Union, and, if possible, in the Eurozone. This contradictory perspective is tenuously held together by the fervent belief that the European Union, and specifically the German government, will accept a significant renegotiation of Greece’s debt leading to a substantial reduction in payments, accompanied by a further round of loans at a low interest rate.